I’d like to put the bond segment right here after the US stock segment because bonds/yields are so important to sector selections in stocks. As noted at the site on Thursday I took the bird in hand (profit on combined price and distributions) of the longer-term bonds funds (3-10yr) held in favor of long-held cash equivalent T-Bill funds (SHV) and a far smaller position on 1-3 year Treasury funds (SHY). SHV is after all, going to keep pumping out reliable monthly income that improves with every Fed rate hike. If this were October 2008 or March 2009 I’d say sure, cash is trash because risk vs. reward in stocks was very positive. But with the combination of a mature stock bull market showing signs of volatility and a rising Fed Funds rate the opposite situation is at hand… cash is not trash. On the longer-term bond picture, while anti-bond sentiment had built up to a degree perhaps sufficient to propel TLT to its 200 day moving average (black) the pump to the 50 day average was fine for me to get off the contrary bond bounce play, at least actively using my own funds. Point proven… you get a triumvirate of experts pumped at you day after day by the media, you prepare for a contrary outcome. That manifested in a bounce. But what of inflation? What of deflation for that matter? It is the age old story as a deflationary force pulls the macro toward its gaping maw (of debt reconciliation) and valiant (some, like your letter writer would say manipulative and immoral) policy makers, both at the Fed (monetary) and in politics (fiscal) try to forestall it by pumping ever more inflationary policy into the system. That my friends is where the disparities of society come from; the unending supply of inflationary policy always at the ready to drive asset prices in one casino or another. But in order to benefit, you have to have a seat at the table. The poor and middle class do not have seats, at least not with the high rollers. I am going to go idealistic on you here for a moment. The system is in my opinion morally bankrupt and upon a would-be debt reconciliation, also legitimately bankrupt. Short of a 2008 style liquidation however, as long as the Fed and political fiscal policy makers are allowed to do what they do, which is inflate the economy at every sign of weakness, the system is not functionally bankrupt. It is inflated; a Keynesian experiment lurching forward after a near-death experience in 2008. So you can see why I did not keep my Treasury bond funds as any sort of investor. As for T Bills, as long as there is a government that functions they should be okay. But one of my core beliefs is that it is all monetary chicanery, from the US dollar to global currencies to bonds (debt) of all prominent indebted nations… it’s a magic show with paper and digital entries representing moving prices of all kinds, but with “value” also being a constantly moving target due to the manipulation of money supplies and debt instruments. Value in my opinion, does not exist in the modern conventional realm. So the bottom line is that neither the United States nor other developed economies are going to go functionally bankrupt as long as central banking has a say in the matter. As long as the majority of global participants accept central banking as a necessary component of the modern financial system (and as long as inflation expectations are under control) there will always be inflation and as such, there will always be great and growing disparity between the rich and the poor. Current asset owners can invest more and capitalize during the long stretches when debt reconciliation is not in play (most recently from 2009 to today, and previously from 2002 to 2008) and with central bankers perceived to be at the ready, always expect the next bailout if things go wrong. The poorer classes do not have the ammo to deploy during liquidations because they’ve barely managed to keep up with inflation during the previous centrally managed expansion. And so it goes, and thus the reasons NFTRH uses bonds as market indicators much more readily than as serious investment alternatives. I just wanted to make that clear for newer subscribers as I may have been seen as pro-bonds out there in public of late. 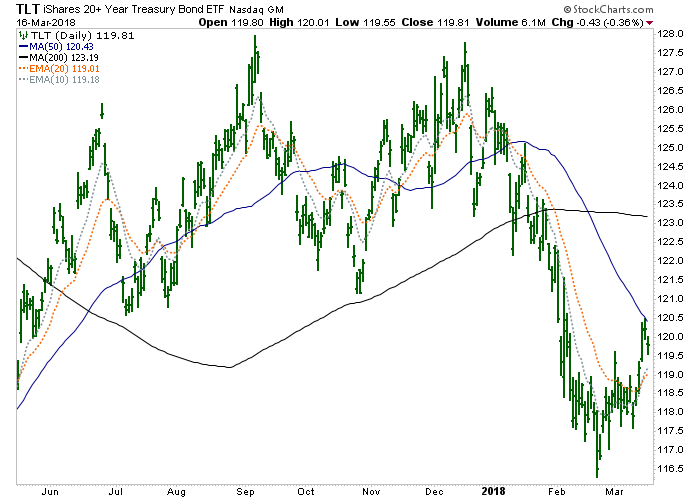 I am not pro-bonds, just anti-media touting that panics the herds at ill-timed junctures. I am anything but pro-bonds. What I am is a macro signal observer. One critical signal is the Continuum (30yr yield) with its monthly EMA 100 ‘limiter’ (aka Amigo #1). So it is no surprise that with all the rising interest rate hysterics in play for the last few months, global yields have started to ease. When playing it straight, the red line on the chart above is a caution point. When playing it idealistically I cannot see how the line of demarcation for a chronic inflator was not broken years ago. …but the 2yr continues apace, and thus the yield curve is still flattening. The bigger picture view (of Amigo #3) is clear. It’s a boom. SPX/Gold Ratio (Amigo #1) says “It’s a boom.” These are the signals playing it straight. It’s still a boom for now. Manage it with your head rather than fighting it with your heart. Gary Tanashian of biiwii.com successfully owned and operated a progressive medical component manufacturing company for 21 years, keeping the company’s fundamentals in alignment with global economic realities through various economic cycles. The natural progression from this experience is an understanding of and appreciation for global macro-economics as it relates to individual markets and sectors.